Hats off to Mick McCarthy. It took some talent to make you feel worse about the Irish football team after the preceding year and a half of gross underachievement. But he's done it. There's no point seeking refuge in the 'they'll just be glad getting away with a win' line. Nobody was talking like that beforehand. The predictions were of a comfortable win and some confidence-inspiring goals for our strikers. The reality was an uninspiring slog and the narrowest of victories. Had it not been for a superb save by Darren Randolph from a Roy Chipolina header just after half-time, this would have been an embarrassment to match that infamous draw against Liechtenstein in 1995. Instead it turned out to be more like the 2-1 win scraped against San Marino in 2007 as the Steve Staunton era lurched from one crisis to another. It is hard to overstate the weakness of Gibraltar. Their part-time team contained players from the likes of the North West Counties and Hellenic Leagues, the ninth and tenth levels of the English football pyramid. These leagues are weaker than the second flight of the League of Ireland. Their leading teams would struggle to win the FAI Junior Cup. In the last World Cup qualifying campaign, Gibraltar lost all 10 of their games, conceding 47 goals and scoring just three. In their last home game Armenia hit six against them. Yet for long periods in this match there was little to choose between the sides. Ireland may have had a decided edge in terms of possession but there was never a sense of the home side being under siege. 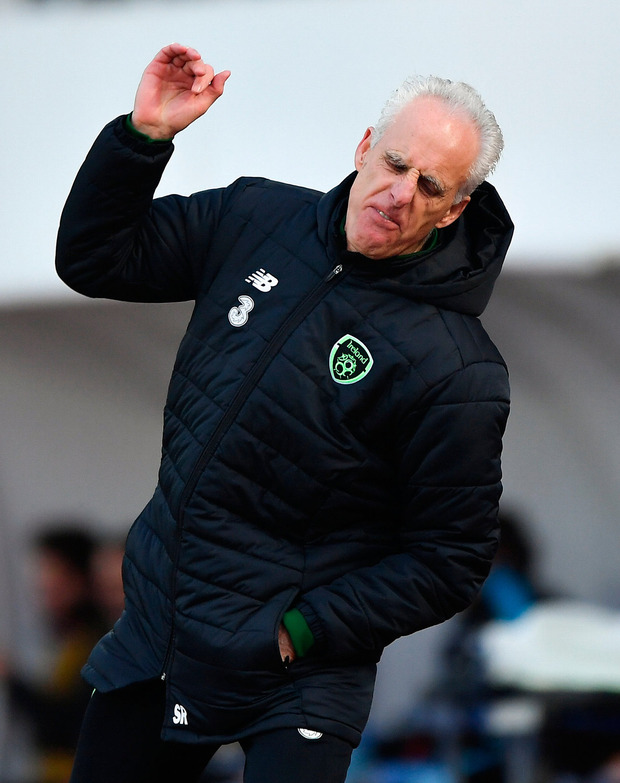 There was a lot of guff talked in the build-up about McCarthy 'putting the smile back on the face of Irish football'. It's odd, this idea of the manager as a kind of Butlins Redcoat charged with chivvying along those disinclined to take a suitably positive view of matters. Perhaps it reflects a suspicion that these days the man's greatest talent is his ability to put the best face on things in press conferences. He will no doubt look on the bright side of this farrago as well. Yet there is no getting away from the shoddy and impoverished nature of the display, epitomised by the persistence with which Ireland lamped hopeful crosses into the box and saw them easily repulsed by the minnows. The ease with which Gibraltar were opened up before Jeff Hendrick's goal showed how vulnerable they were to any kind of composed creative football. Yet the only pressure Ireland exerted after that was through a series of set-pieces. The first half was a kind of nadir for Irish football, with our only chance coming after a series of comic defensive lapses almost resulted in an own goal. Gibraltar, like most teams, are gutsy but they are absurdly limited and seemed almost shocked at their own temerity every time they strung two passes together. It seemed somehow fitting that their two best players, Roy and Joseph Chipolina, sound like they should be slinging buckets of water at each other in the Duffy's Circus ring. It's customary at this point in proceedings to praise the Irish team for trying. Very well. This was about as trying a 90 minutes of football as you could wish to inflict on your worst enemy. Those who expected a kind of renaissance sparked by the new man in charge will be disappointed. At first it might strike you that choosing a manager whose impending resignation was announced on the same day as his appointment might have been a mistake. But that is to misunderstand the nature of the game being played by the FAI. No matter how badly McCarthy does, any concerns will be swatted away by pointing to the bright future which awaits under Stephen Kenny. The current reign will be the equivalent of a 'free play' in rugby. It is the latest masterstroke gifted to Irish football by John Delaney, a man whose antics over the past week have further lowered the game's estimation in the eyes of the Irish sporting public. We can smirk over the inclusion of Gibraltar et al in international competition but they are not the ones who look like a banana republic at present. Anyway, bring on Georgia. Though all the brave talk about Switzerland and Denmark seems pretty daft now. Those inclined towards optimism might take solace from the old saying that it's a long road with no turning. Those of a more realistic bent will perhaps point out that there might be no turning because the road is headed over a cliff. Late in the game McCarthy replaced a striker, Seán Maguire, with a midfielder, Harry Arter. As injury-time began, Richard Keogh punted the ball into touch near the Gibraltar goal-line so that Ireland could try and pin the home team down there. We were holding on against Gibraltar, ranked 194th in the world between Bangladesh and Brunei. Declan Rice must be kicking himself.